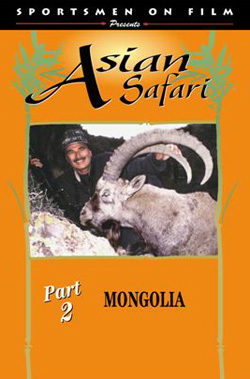 This second part of the Asian safari epic covers hunting and adventure throughout Mongolia with Bob Kern, Lad Shunneson and Ken Wilson. From the capital of Ulaanbataar, travel to the Gobi Desert for White-Tailed and Black-Tailed Gazelle. A Sportsmen on Film DVD production. This second part of the Asian safari epic covers hunting and adventure throughout Mongolia with Bob Kern, Lad Shunneson and Ken Wilson. From the capital of Ulaanbataar, travel to the Gobi Desert for White-Tailed and Black-Tailed Gazelle. Hunt herds of Siberian Ibex in the Western Altai Mountains. And then hunt Maral Stag by horseback and foot. Live in gers and share the traditions of the nomadic Mongols.